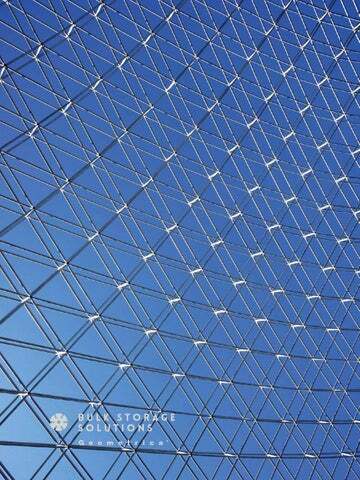 Geometrica速 specializes in the coverage and storage of bulk materials. We are devoted to helping you achieve the optimum and most economical solution for protecting your materials from the elements. This selection of Geometrica domes represents a small portion of the many storage solutions we have supplied to the cement, power and mining industries around the world. Top producers in these industries prefer Geometrica as their supplier because of advantages not available from conventional structures. Geometrica provides an economical and suitable structure to cover their bulk storage. The advantages of the Geometrica system are clear. Galvanized steel or aluminum tubing are the right materials to build large enclosures from 50 to 300 meters in span. Metal panels offer a clean, strong finish that needs a minimum of maintenance over the years. Our custom CAD software lets us design and generate geometries exactly suited to your building requirements. In many cases assembly may proceed over operating yards, saving time. And the inherent economy of the dome shape conserves materials and eliminates wasted space. 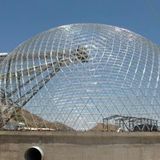 Having built the largest and most challenging domes in the world, Geometrica gives you the stability and experience you need to get your project completed on time and under budget. For the most intelligent solutions in cement, power and mining bulk storage, turn to the specialists at Geometrica速. Bulk material storage Material stockpiles may be classified in four general categories by their shape: ring, conical, longitudinal and free form. Conical piles are formed when material is dropped from the end of a fixed conveyor belt. Slewing conveyors form ring piles. Linear stackers or tripper conveyors form longitudinal piles. And moving equipment such as trucks and front-end loaders form irregular piles. Any of these types of piles may rest directly on the ground, or may be constrained by a wall. Geometricaâ&#x20AC;&#x2122;s geodesic domes easily adapt to each of these types of piles and cover even the largest ones. Coni c al S to c kpiles The circular-plan storage dome is the most basic of the many Geometrica structures, keeping the environment and materials neatly protected from each other. Ores, aggregates, clinker, coal and even organic materials such as grain or fertilizers may be stocked very economically in conical piles and covered with a protective dome. Geometrica storage domes may be designed with an efficient parabolic profile to give several advantages. Following a stockpileâ&#x20AC;&#x2122;s angle of repose produces smaller interior air volumes for better dust collection. The parabolic shape produces a stronger apex for supporting concentrated loads, such as conveyor galleries or dust collectors. And the reduced surface area results in lower cladding cost. The 5000m2 Coemin ore concentrating plant in Chile required a freestyle solution to meet existing space constraints. F ree for m S to c kpiles Geometricaâ&#x20AC;&#x2122;s exclusive FreedomeÂŽ technology makes it possible to cover areas of any shape: circular, rectangular, or even freestyle. The structure may rise from the ground, or it may rest on material containing walls. A Freedome may be adapted to sloping or uneven terrain. There is no need for costly earth moving or leveling. Simply lay out the foundation to follow the natural slope and a Freedome can be designed to spring from it. Freedomes are especially suited for established facilities that need to contain an existing open air stockpile. Often the area is surrounded by roads or other buildings, making the construction of a new cover difficult. Geometrica can design a Freedome to fit the pre-existing shape of the area, eliminating the need to relocate the stock pile or build a new facility. Only Geometrica can provide this kind of versatility. Each Nemak dome covers 18000m2 of column-free space. Domestic solid waste FreedomeÂŽ in Qatar flows over equipment, access openings and internal building. San Cristobal dome in Bolivia spans 142m while adapting to varying terrain and support conditions. Longitudinal Domes Longitudinal structures are ideal for covering linear beds of raw materials like coal, limestone and ores. Open ended or completely enclosed, these structures may be designed with different sectional profiles to provide the most efficient envelope over materials, machinery and vehicles. Lattice Roofs For general industrial storage, Geometrica lattice roofs are the economical solution in short or medium spans. Roofs can be built from the ground up, added on to any structure or constructed over existing work areas. Column spacing may be as large as 50 m by 50 m. As with other Geometrica structures, galvanized steel or aluminum tube components provide years of maintenance-free service. Geometrica lattice roofs offer large, obstruction free areas for storage of finished products in pallets, bags or other containers. The flat, sloped or curved, Geometrica lattice roofs can have interior or exterior cladding. D etails A N D O P T I O N S Natural Lighting Translucent cladding panels in matching profiles bring daylight into Geometrica domes and save energy costs. Natural Ventilation Ventilation openings can be designed into the structure to provide the desired air circulation. Anchoring Systems Several anchoring options are available, including: cast in place (second pour), welded to embedded plates, and drilled anchors. Access Openings Openings of nearly any shape and size for vehicle and personnel access may be incorporated into your Geometrica dome. Doors, frames and canopies are available for all openings. Conveyor Openings Accommodations are easily made for conveyors, chutes or blending equipment, without compromising the structural behavior of the dome. Access Ladders and Manwalks Exterior or interior manways can be designed and supplied with your building for convenient and safe access. Metal Cladding Geometrica steel cladding is galvanized and coated with a baked-on polymer to give superior corrosion and ultraviolet ray resistance. Profiles are designed to best suit your job, and include rectangular or standing seam panels. Rectangular panels may be fastened to the inside of the structural frame to protect against fire or corrosion hazards. © Geometrica, Inc. 2014 All rights reserved.